The Golf Club at Dove Mountain is the perfect complement to the 27 championship holes of Jack Nicklaus Signature Golf. More than 45 miles of trails, tennis and a 45,000 sf clubhouse. Luxurious customizable single-family homes from the $1 million to over $3 million. Add your contact information below to request more information and to join our membership list. You will be the first to be apprised of happenings, private events and special opportunities as they pop up. At The Ritz-Carlton Residences, Dove Mountain, there are eight superb single-family home floor plans to suit every need and lifestyle, but you can consider them a starting point. We can customize one to your specific needs. “Unique” is an overused – often misused – word. But, not in this case. 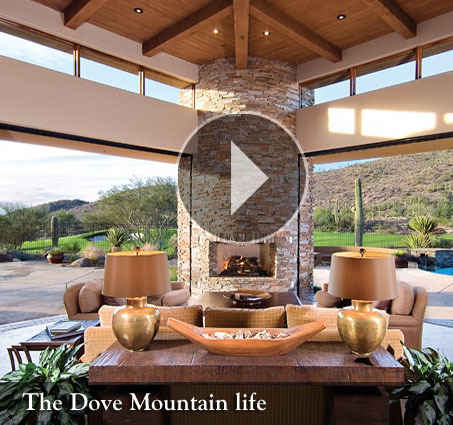 Envision life in the Sonoran Desert at The Ritz-Carlton Residences, Dove Mountain. An exclusive community of towering saguaros in the foothills of the majestic Tortolita Mountain range outside Tucson. Basking in sunshine 350 days a year, while the rest of the country soaks in rain and snow. Wake up to the challenge of the twenty-seven inspiring holes of Jack Nicklaus Signature Golf that surrounds you. Avail yourself of the luxurious amenities and legendary service of the renowned Ritz-Carlton, Dove Mountain hotel which are at your beck and call. Enjoy The Ritz-Carlton Residences, Dove Mountain’s 800 acres of natural desert beauty, perfect for hiking, biking and horseback riding. No other private community of luxury homes in Tucson can offer you all these amenities just outside your door. Whether you love golf or you just love life, there is nothing quite like The Ritz-Carlton Residences, Dove Mountain. Finding out whether or not it is just right for you begins with a call: 877-451-7205. Perhaps you know someone who might like to see this website and everything we have to offer. If so, enter your email address and your friend's and we will send an invitation to this site, courtesy of you. We won't share your email or your friend's and will not contact them, unless they request we do so.